Located on the outskirts of Dumbarton and just a 10 minute drive to Loch Lomond and 5 minutes from the Dumbarton golf club. Glasgow city centre is just a 25 minute car drive and Dumbarton train station is under a mile away. 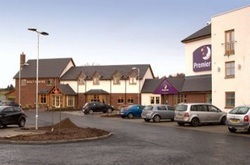 The Premier Inn Dumbarton offers free on-site parking and a Brewers Fayre restaurant. Book direct for the best Premier Inn Dumbarton deals.